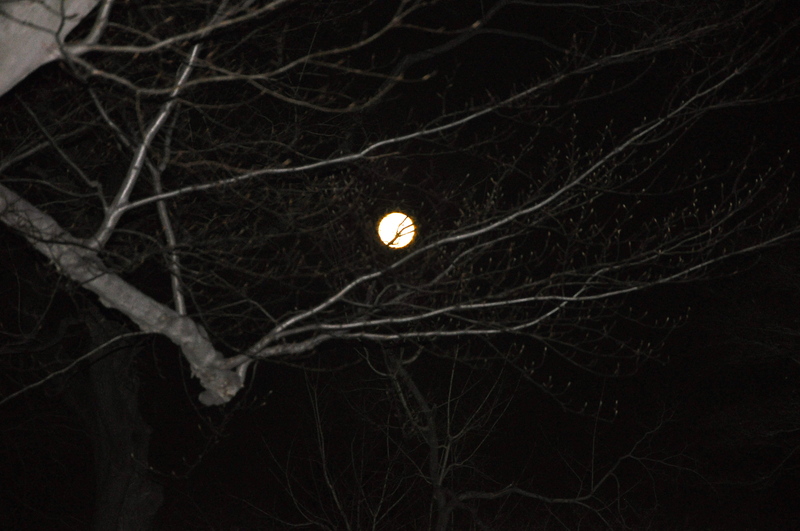 Perigee Moon and Spring, All in One Weekend! How could you not notice the moon last night?! Last night I was driving east at about 8 pm or so and noticed the moon. I don’t think anyone could miss it last night, truth to tell. The moon was huge. 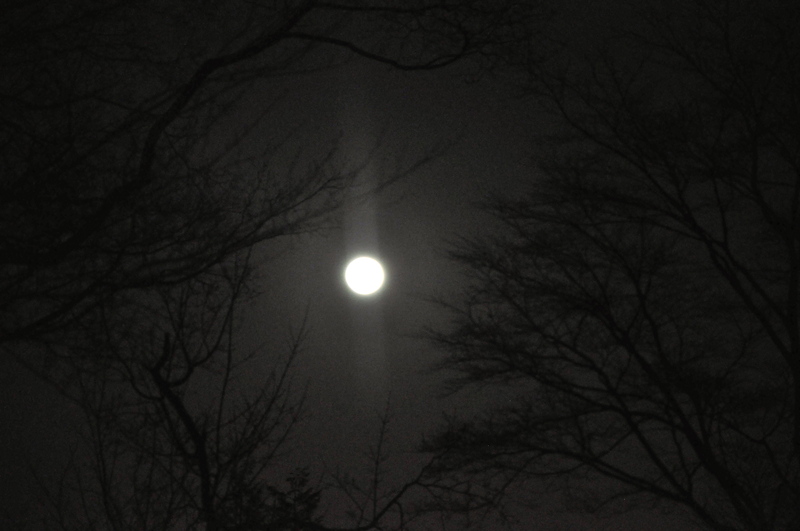 Actually, the moon was huge, full and bright. It was beautiful. When I got home I grabbed my Nikon D90 and headed back outside to take a few photos. It was really nippy by then. Okay, my teeth were chattering, but I got my photos. It was a perigee moon, a rare lunar event that last occurred in March 1993. 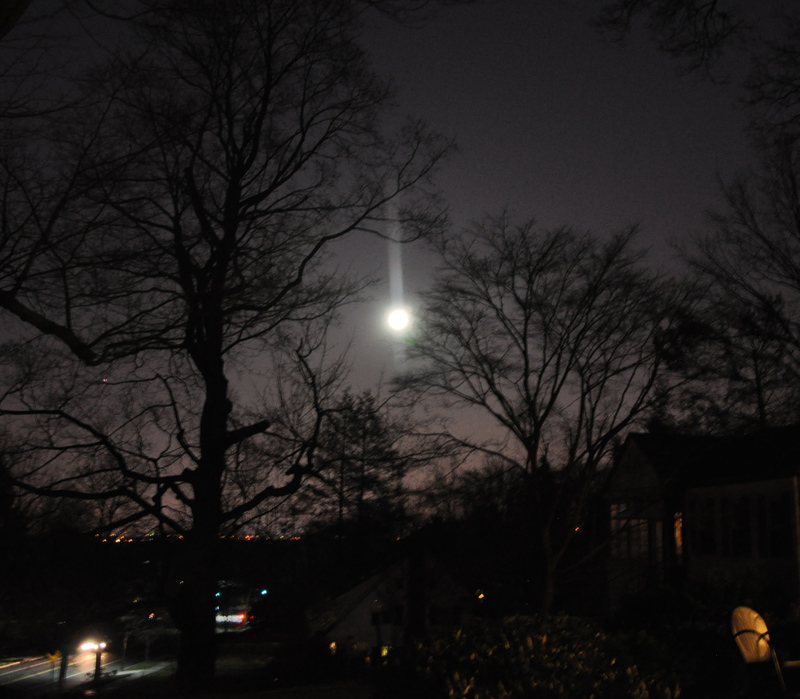 Did you see the moon last night? What did you think of it? Do you remember it being as large in March 1993? Ah. Me neither, so don’t feel bad. I have trouble remembering what I ate for dinner a few hours after I’ve eaten it, never mind what the moon looked like on a specific night almost 20 years ago. "It was a dark and stormy night". . .uh, wrong! But it does look a little sinister in this shot, right? Some folks were thinking/writing/talking about how perigee moons trigger natural disasters. Did a natural disaster happen near you? The only natural disaster I experienced was losing my footing on my front hill; I slipped and fell into the rose bush I was pruning. It hurt and all, but I don’t think that’s the sort of natural disaster some folks were thinking/writing/talking about. My venerable beech tree makes this shot lovely, in my opinion. I pulled this pot out of the unheated greenhouse. Survivors! I have survivors! Today it’s another beautiful weather day here in Northern New Jersey, a bit chilly, but sunny. I’ve been out working in the garden again. Today I plants hostas (‘Patriot’) and astilbes (‘Key West’), spruced up the raised veggie beds, and pulled the strawberry pots out of the greenhouse; they overwinter there every year, and come spring, I pull them out, see what survived, and replant the empty holes. 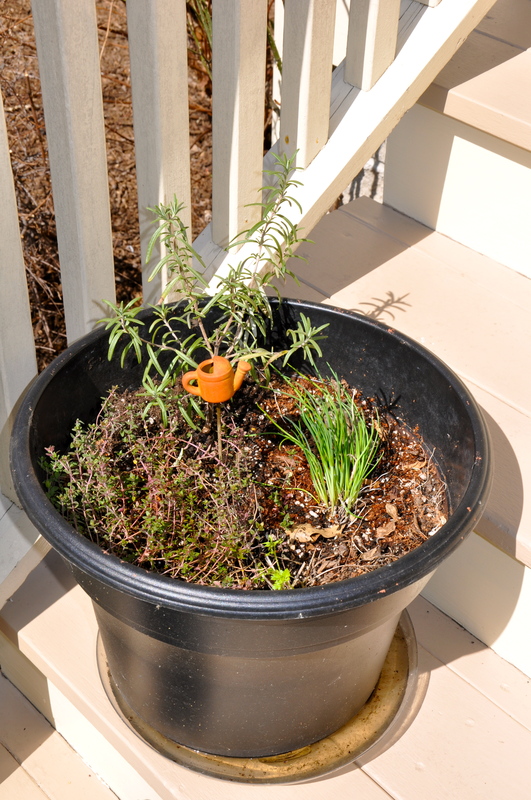 I have a ton of self-seeded forget-me-nots in a bed on the west side of the house so I plugged the empty holes with some of them for now; it’ll make a very pretty spring vignette. 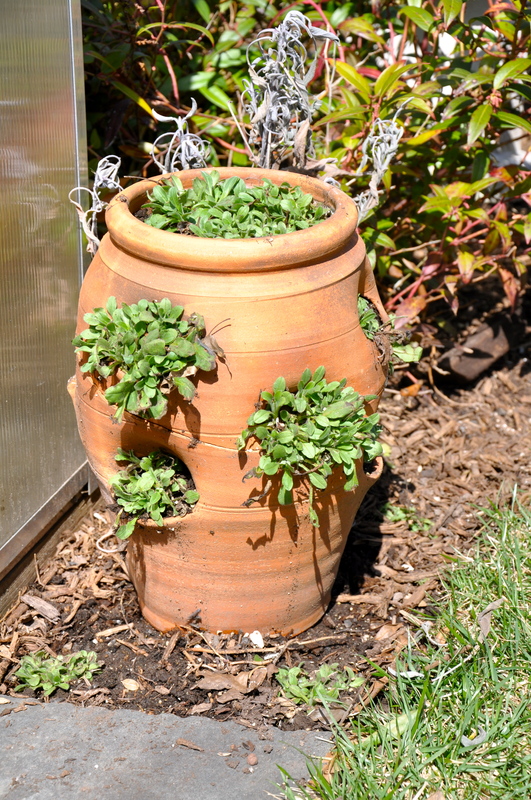 This pot will look terrific when the forget-me-nots bloom! 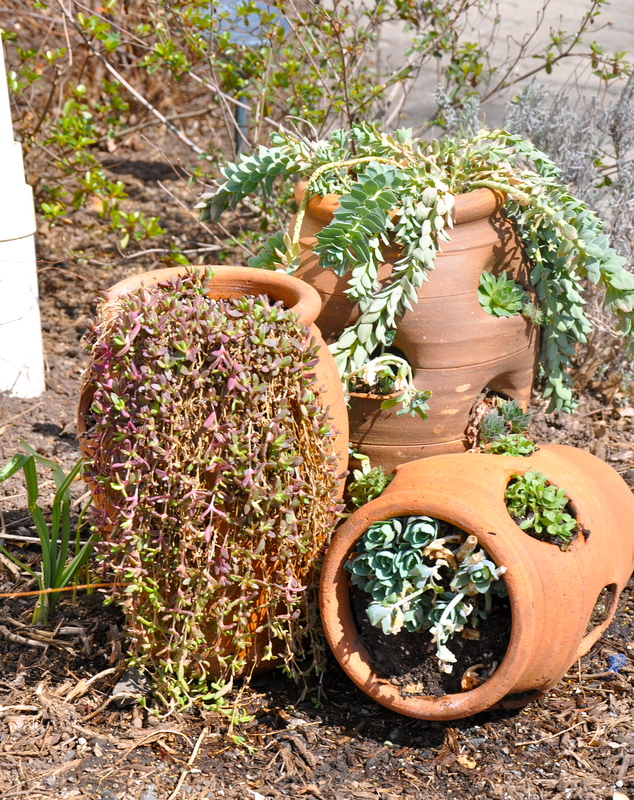 These pots are pretty old; it's a surprise every year to see what lived through the winter in the unheated greenhouse. Your shots of the moon are really cool. I wanted to take some pictures of it too, but I was out without my camera and by the time I got home, I lost my ambition. Thanks for the photo compliment, FringeGirl. I thought the moon was really beautiful! Today? Not cool at all. More like freezing and snowing like all get out. I raced outside this morning in my nightgown to drag some of my pots back into the greenhouse. The rosemary was shivering. Shivering! And never mind what the poor sprouts of perennials are thinking! I worked so hard to uncover them this weekend. Can’t rush Momma Nature (even though I try every year). I was so bummed out I videoed the snowfall. Take a look later when I post it. Can’t believe you have snow…don’t you remember the year it was 90 in April then snowed?!! !